In the spring of 1917 an apprentice from the Cumberland Paper Mills, just outside Sydney, was walking along a bush track beside the Lane Cove River when he discovered the partially burnt body of an unidentified woman. The arrest three years later of a 45-year-old Italian, Eugenia Falleni, for murder, led to an investigation that fascinated Australia. Known in the newspapers as the ‘Man-Woman Case’, the trial revealed that from the time she had left New Zealand and gone to sea as a cabin boy, Eugenia Falleni had lived at least twenty years of her life in the guise of a man. 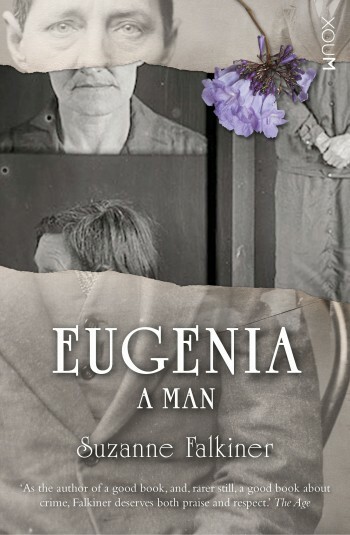 Suzanne Falkiner has written a remarkable story that follows the course of her own efforts to accurately reconstruct Eugenia’s extraordinary life, and provides an intriguing account of her subsequent trial. Exploring questions never able to be answered at the time, the author reveals some of the secrets of a transgendered existence in an era when leading such a life was dangerous and unacceptable. EUGENIA: A MAN was published in late May 1988 in a small flurry of publicity. One Tuesday morning soon afterwards, while I was being interviewed by George Negus on the ‘Today’ program on Channel 9, a woman called Nancy Cracknell telephoned the station from Lakemba and asked to speak to me. Tuesday was the day the pest control people were coming to fumigate the house, so she was having an early breakfast, Nancy told me when I rang her back. She had switched the television to one of the morning chat shows—she enjoyed those programs because it was like meeting new people, she said. The pretty girl announcer whose name she couldn’t remember had been saying something about transsexuals, but she wasn’t really listening because it wasn’t something that interested her. Then she heard the name mentioned, Eugenia Falleni. ‘That’s Arthur Whitby’s mother-in-law!’ she thought. I felt slightly at a loss: I had never considered Eugenia as a mother-in-law. SOME TIME after this the telephone rang again and a man asked to speak to me: it was one of those calls where you know that the caller has checked the directory but isn’t entirely sure whether the number found is the one that is wanted. ‘I rang to congratulate you on the book—’ said the voice. Again I was momentarily at a loss. The name was familiar, although I couldn’t immediately place it. Suddenly it dawned on me: I was being telephoned by one of the characters in my book. Stewart Robson was the detective sergeant who had arrested Eugenia Falleni and conducted the investigation that led to her conviction. ‘I am the grandson,’ he explained.